Timber! 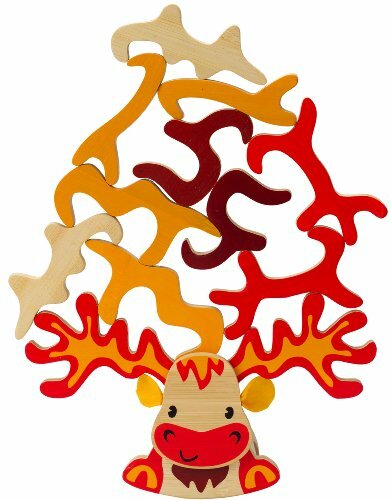 The Super Moose Bamboo Balancing Game will have children laughing with pleasure as they build giant antlers on the moose and watch them tumble down. Carefully stack and balance the 12 antler pieces on the moose without letting them tip over, playing by yourself or with a friend. The warm yellow and red colors are reminiscent of autumn and add to the whimsical visual appeal of this entertaining game. Encourages balance, coordination, and good sportsmanship. Made with bamboo sourced from environmentally sustainable forests. Durable child safe paint finish and solid wood construction make this a toy your child will love for years to come. Hape toys stimulate children through every stage of development and help nurture and develop their natural abilities. All Hape products sold in North America meet or exceed all applicable safety standards. The Super Moose Bamboo Balancing Game is a proud recipient of the 2012 Oppenheim Toy Portfolio Gold Seal Award. View More In Stacking Games. If you have any questions about this product by Hape, contact us by completing and submitting the form below. If you are looking for a specif part number, please include it with your message.